When the popular LaxPower website shut down last offseason, MaxLax undertook a project to create our own mathematical formula to compare teams in order to give fans — and coaches and players — an additional method of comparing teams. 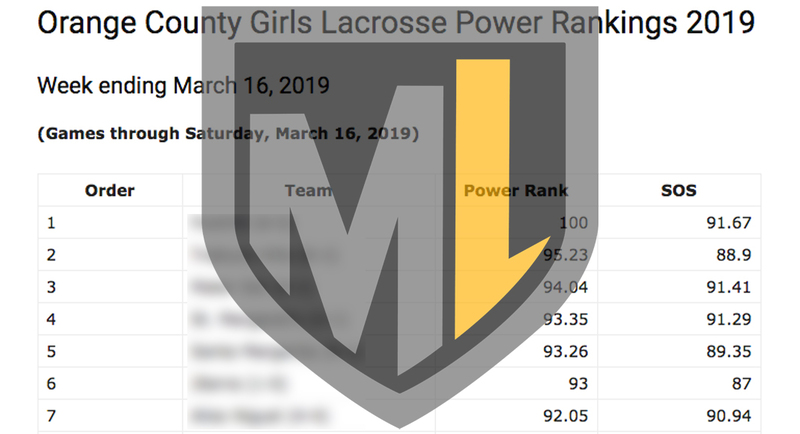 In the initial calculation — made before Monday’s games — Foothill (6-0) tops the MaxLax OC Girls Lacrosse Power Rankings thanks to undefeated record against a strong schedule. Four of the Knights’ wins are over teams ranked in the algorithm’s Top 15, along with wins over La Costa Canyon out of San Diego and Agoura, an LA Top 10 squad. St. Margaret’s (3-1), the defending section champion and No. 1 in the coaches poll, is No. 4 in the power ranking, and Mater Dei (3-1), No. 2 in the coaches poll, is No. 3 in the power ranking. Trabuco Hills (6-1) is No. 2 in the power ranking, though only No. 5 in the coaches poll. Other teams whose ranking looks better according to the algorithm than based on the coaches poll include Woodbridge (7-1) — unranked by the coaches but No. 14 in the power ranking — and Chaparral (2-3) — No. 19 in the coaches poll but No. 15 in the power ranking. On the flip side, the coaches have Capistrano Valley (0-2) at No. 20 but the algorithm places the Cougars No. 46. The complete MaxLax OC Girls Lacrosse Power Rankings are available here, with a MaxLax subscription. Developed by Michael Traub (Aliso Niguel ’13, MIT ’17), the algorithm processes the final scores of completed games to calculate a rating based on each team’s goal differential in competitive games. The objective is to determine what each game outcome teaches us about a given team, then reflect that in a numerical rating. An expected blowout that actually ends as a blowout is non-competitive and teaches us nothing. An expected blowout that winds up being close, or competitive, teaches us something. For these reasons, the algorithm relies heavily on the concept of competitive games, defined as those in which the score was close or was expected to be close based on each team’s relative power rating. These games reveal a team’s true quality and have much more influence over the ratings than non-competitive games. To hedge against teams receiving credit for running up the score in non-competitive games, the algorithm also evaluates how much a particular game should influence the ratings by calculating a “competitive factor” (CF). Games with a high CF influence the power ratings more than a game with a low CF. Have questions or comments about the new feature? Contact us at [email protected]. Editor’s Note: MaxLax is a community- and subscription-supported website whose mission is to spotlight lacrosse, its teams and its players in Southern California. This post is available to the public, with no subscription required. If you follow lacrosse in SoCal and enjoy our coverage, please consider supporting MaxLax with a subscription.